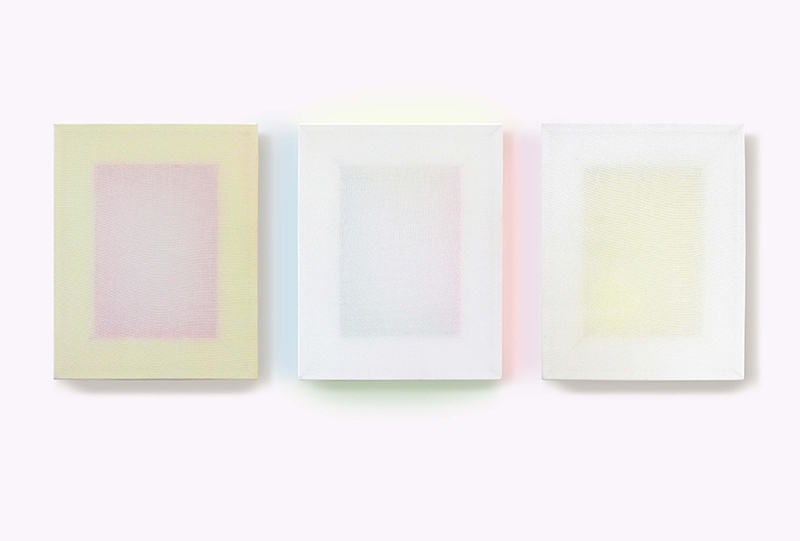 Patric Sandri’s paintings are lingering in between abstract art and minimalism, with their clear white canvases, colorful borders, moiré patterns and blurry outlines. His art is surprisingly clear and unclear at the same time and its simplicity is quite deceiving – Sandri is engaging in detailed color and light study, inviting his viewers to join his exploration of the very medium of painting. 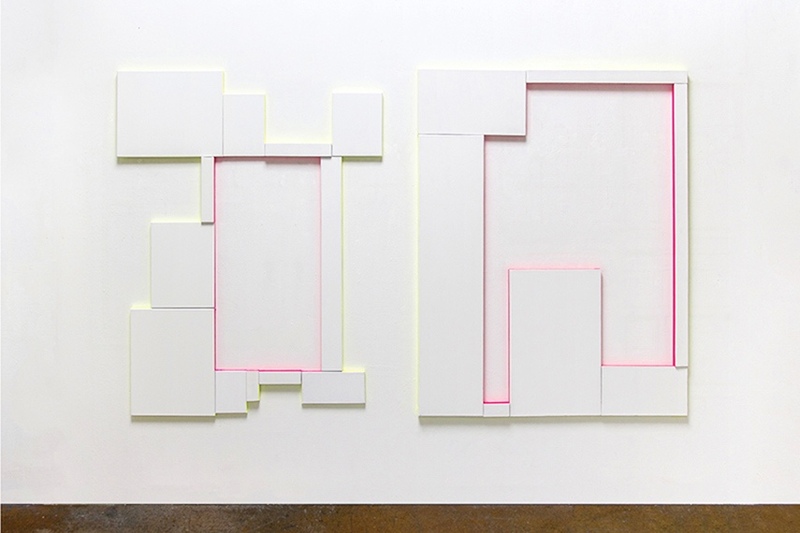 The artist is not sticking to any traditional rules in his work, he is rather questioning the rules themselves and trying to reach to the bare essence of the minimalist aesthetics. Sandri is clearly a contemporary artist, with a straightforward approach and a simple desire to draw his viewers into his world of glowing colors, subtle reflections, and modern neon pigments. He is exploring both hypnotic moiré patterns and pure geometric forms without any need to engage in storytelling, metaphors or creation of emotional contents. His main quest is to show the underlying concept of minimalist aesthetics through the purity of his materials, the subtlety of his textures and carefully planned interplay of light and shadows. He is fascinated by the fact that beauty in art is born out of literally nothing, out of the void. Also, beauty is just a fragile balance of various elements that reach the viewer’s eyes and Sandri focuses on the double aspect of looking, by the artist and by the viewer. To put it simply, Sandri wants to understand how the viewer’s perception and illusion create the concept of beauty. The ideas of interruption and inconsistency have become the central parts of Sandri’s visual research. 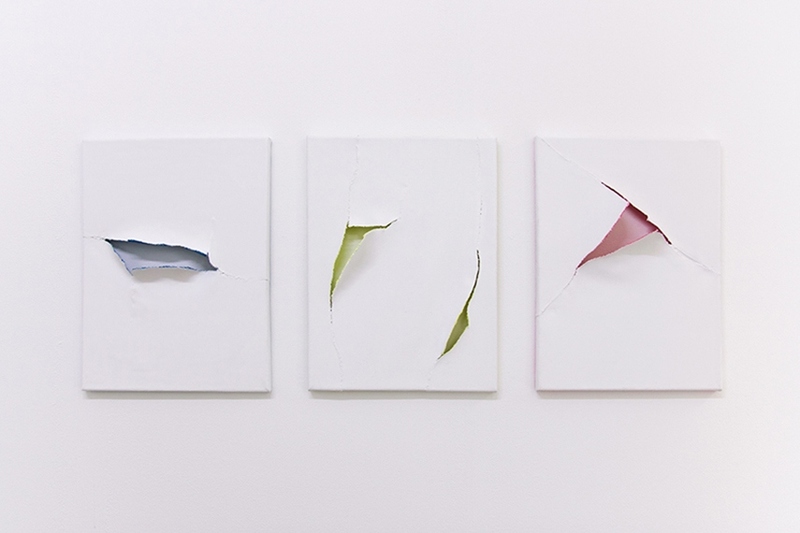 He considers his canvases experimental battlegrounds and vehicles of investigating the zones of impact and reaction. The way various forms are clashing or colors standing out from the background are crucial parts of Sandri’s research. Also, it is important to mention that unlike the traditional painters, Sandri puts the same weight and importance on the front and backsides of his canvases, because he perceives his artworks as objects in space that don’t have only simple artistic value. The entire body of his image is treated as an autonomous sculpture with a separate lighting and a separate function in a designated space. 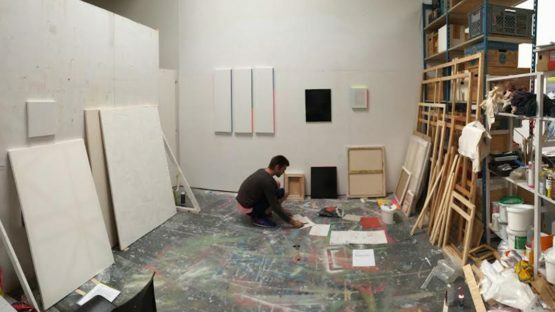 Sandri’s enticing ways of exploring the process of painting and questioning the basic role of the image had brought him more than 25 solo and group exhibitions, the most recent ones held in Zurich and Vienna as well as in Naples, Italy. The secret of his art lies in his ability to create palpable textures, vivid hues, deconstruct various forms and put them in a new order while convincing his viewers to surrender themselves to his pure forms and understand a little bit more the principles of beauty lying below the surface. The artist is represented by Lisabird Contemporary. Patric Sandri lives and works in Zurich, Switzerland.